Each mode of the quantized radiation field can be associated with a quantized harmonic oscillator. 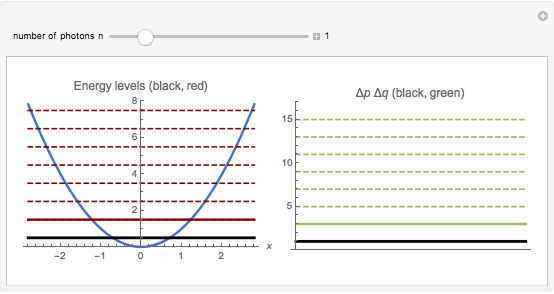 This Demonstration shows the dependence of Heisenberg's uncertainty product (for momentum and position ), on the quantum number , when the oscillator has the energy eigenstate (in units of ). The integer denotes the energy and the number of photons in the radiation mode, . The uncertainty product is an increasing function of . 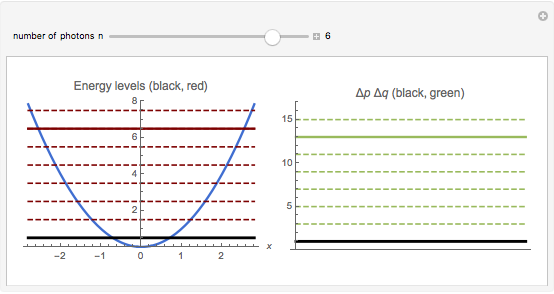 The minimal product is valid for the energy ground state, , represented by black lines in the diagrams. In contrast to a state with a definite number of photons, a coherent state is defined in quantum optics as an eigenstate of the photon annihilation operator , , where is complex valued. The radiation of a single mode laser represents such a state; each coherent state has the minimum-uncertainty product allowed by quantum physics, . Therefore, coherent states provide the closest quantum mechanical analog to a classical single-mode field. These are not shown in this Demonstration. In quantum physics it is well known that two observables and can be incompatible, with . These are represented by noncommutating Hermitian operators: . As a consequence, the uncertainties and do not vanish simultaneously; denotes the variance of the operator . The variances depend on the actual state of the physical system. Therefore, no quantum state exists for the physical system considered with and . As an example, the Heisenberg uncertainty relation follows from the quantum commutation relation of the noncommutating operators momentum and position and is valid for each quantum state. P. Meystre and M. Sargent III, Elements of Quantum Optics, New York: Springer–Verlag, 1991. M. O. Scully and M. S. Zubairy, Quantum Optics, Cambridge: Cambridge University Press, 1997. J. J. Sakurai, Modern Quantum Mechanics, Reading, MA: Addison–Wesley, 1995. Reinhard Tiebel "Heisenberg Uncertainty Product for Different Photon States"